A recent Economist article: “The Creed of Speed” http://www.economist.com/news/briefing/21679448-pace-business-really-getting-quicker-creed-speed challenges some of the generally held views that change is accelerating, which makes long term strategy setting potentially futile. This ties is with my chapter on mind games, covering some of the factors that can influence our approach to risk in developing strategy. One of the most pervasive concepts we have when thinking about strategy under uncertainty, is that it is getting more difficult because change is just happening more quickly. So we tend to be more likely to conclude with Error Type B (See Chapter 1), there is no point in making decisions because the chances are very high that we will have to change them in a little while, when something else big happens to change everything. “I’m not totally convinced that change is actually happening faster now than it was in the past”. Oops there, I have said it. Partly, I wonder if it’s the basis for not making decisions which as leaders, I believe we are often paid to make. I wonder if it’s a bit of a cop out. There is one example of where I am aware of an illusion that helps to promote this idea. It is the illusion that our population has been growing faster in recent decades than it has been throughout the history of mankind. And it is captured in a graph that looks something like the one below. The headline is “here is another example of how much change is accelerating in the last hundred years or so”. 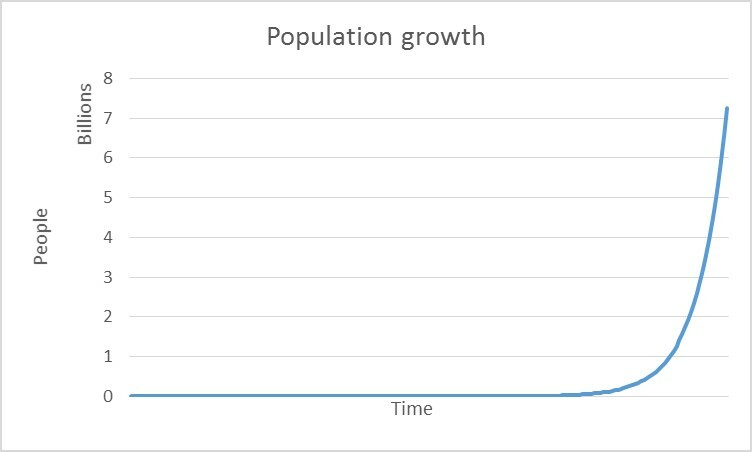 The reality is that this curve is the output from a mathematical model of population growth. The rate of growth actually remains the same throughout the time period represented by the x axis – ie as shown here, since the beginning of time. The main driver of population growth is the average number of offspring per couple who then go on to reproduce themselves. If this growth factor is above 2, population grows; if it is below 2, population declines. In this model, this growth factor is actually the same throughout the time period represented. 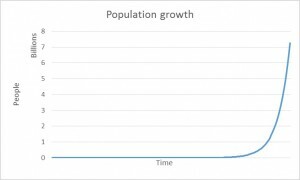 Population growth is not actually accelerating; the rate of sustainable reproduction has remained the same throughout the time period.